It's been as tough as a two-dollar steak to wait for the second season of Netflix's House of Cards, but Francis and Co. finally have a return date. 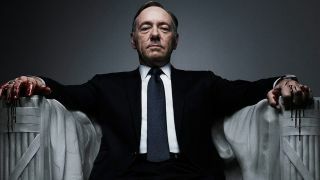 Subscribers to the streaming service will have total access to House of Cards Season 2 on February 14, 2014. Yes, that's Valentine's Day, so whisper sweet nothings about loving your honey more than sharks love blood and commence binge-watching all 13 episodes. Until then, look on as Claire takes a single, slow-mo pull from a cigarette in this Season 2 teaser. Whatever could be on her mind? Coffee? Booze? It's 2 a.m. ... you can go either way. Just bring blips along.